O’Dwyer will have to wait to make his impact in Croke Park. Seamus Callanan leads the line for Tipp. 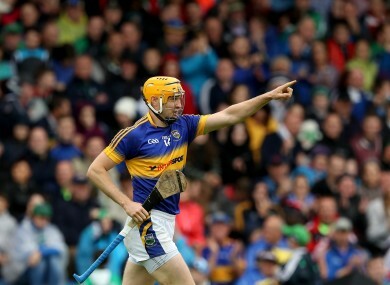 TIPPERARY BOSS MICHAEL Ryan has resisted the urge to recall John ‘Bubbles’ O’Dwyer to the starting line-up for Sunday’s All-Ireland SHC semi-final against Galway in Croke Park. O’Dwyer will undoubtedly play some part in the clash, but will have to wait to do so as Ryan has named an unchanged line-up from the Premier outfit who won out so convincingly in the Munster final clash with Waterford. Galway boss Michael O’Donoghue has also named an unchanged side for the 15.30 clash on Sunday, albeit with some positional and jersey changes expected. Email “Bubbles benched as Tipp and Galway name unchanged sides for Sunday semi”. Feedback on “Bubbles benched as Tipp and Galway name unchanged sides for Sunday semi”.